It’s especially important given the fact that Wikileaks is playing a leading role in the Snowden case, to the dismay of some of Ed’s admirers and even members of his family. Not to mention that Snowden, as of this writing, is still in Moscow. One need not be a counterintelligence guru to have serious questions about Shamir and Wikileaks here. It may be a much bigger part of the story than it appears to the naked eye. “Assange’s defenders will complain there is no smoking gun linking WikiLeaks and its cult leader to Moscow. There isn’t, but that’s because in the real world things don’t happen the way they do in the movies. There is no receipt in a desk waiting to be found by an eager journalist. No child prodigy is going to hack a phone in five minutes and find a voicemail from a man with a thick Russian accent explaining the exact location of a dead drop. These accusation are not, therefore, wild conspiracy theories pulled from thin air. As a reminder, the media and Congress took seriously the idea Reagan conspired with the Iranians to not release the embassy hostages until after the election. The so-called evidence which led to twelve years of media and Congressional investigations was the timing of the incident and the bizarre claim by a professor that VP candidate George Bush boarded an SR-71 and flew to Paris to meet with the Iranians. Democratic Speaker of the House Tom Foley literally said evidence was irrelevant and all that mattered was the “seriousness of the allegations.” It’s curious to see the media and Democrats suddenly so concerned over fake news. Now there is both evidence and a serious allegation, but the Right, especially Trump surrogates, shout down any suggestions of an investigation in apparent fear of making Trump’s election illegitimate. This is infuriating on multiple levels. First, because it turns the Right into the Left. As Jonah Goldberg defines it, “The essence of progressivism is to be hostile to any external restraints on progressivism.” Thus, rather than standing for principles, the Right is standing for a man and for their political power. Moreover, the Right is, historically, the side which expels its bad actors rather than excusing their bad behavior yet now seems so fearful of what an honest investigation might reveal about their own side they refuse to countenance an investigation into a serious breach of national security. By allowing this situation to go unexamined, they allow it to fester possibly leading to even more severe national security problems down the road. As for delegitimatizing the election, to the Left that started on election night and only the excuses changed; it was a whitelash, Trump is unfit so is illegitimate, we’re scared so its not legitimate, the electoral college is undemocratic, and none of these have gone away or ever will. Did the Left ever stop denouncing Bush over the Florida faux-recount? Finally, its a toss-up which logical fallacy the Left uses more: the Strawman or the false dichotomy. Trump one the election. Period. It is true Russia conducted espionage and interefered in the election. Full stop. Both can be true. One does not automatically invalidate the other. Dear Right, please stop acting like the Left. So many disasters and outrages have occurred during the Obama administration it becomes easy to lose track and forget. Let’s not forget that while Obama and the media were condescendingly ridiculing Romney for labeling Russia our biggest geopolitical threat, a hot mic revealed Obama cozying up to the Russians. One of the many reasons this issue needs an investigation is to fully understand the extent of Obama’s disastrous policies and attitude toward Russia. Moreover, it is a much broader issue and getting caught up in supporting Trump over principle drowns out the constant cyber attacks against the United States. Again under Obama’s watch, let’s not forget the Chinese hack of 22.1 million personnel records. Unsurprisingly, the current media outrage over a foreign power’s cyber attack on the US was not present. 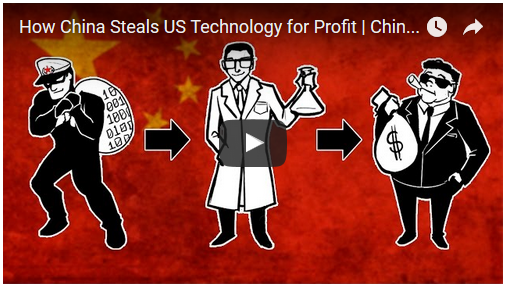 The Chinese military routinely hacks US government and businesses to steal information and technology at an estimated cost to the economy of $5 trillion. Per year. It would be nice if both Left and Right, Republicans and Democrats, would stop posturing for political gain, investigate cyber threats seriously, and institute appropriate countermeasures against the bad actors of the world. You’ll forgive me if I don’t hold my breath.